CHARLESTON, WV (March 9, 2018) - The West Virginia Power, Class A affiliate of the Pittsburgh Pirates, are excited to release their 2018 promotional schedule. Over the course of the 2018 season, fans will be treated to spectacular fireworks shows, special discounts, one-of-a-kind giveaways and unique appearances at Appalachian Power Park. Single-game tickets are on sale now for all of these exciting promotional nights and will remain at the Dime-Per-Degree price of $2.80 through Sunday, March 11, at 11:59 p.m. Tickets will only be available on the Power website throughout the weekend and can be purchased in person at the West Virginia Power box office or over the phone beginning at 10:30 A.M. on Monday, March 12. 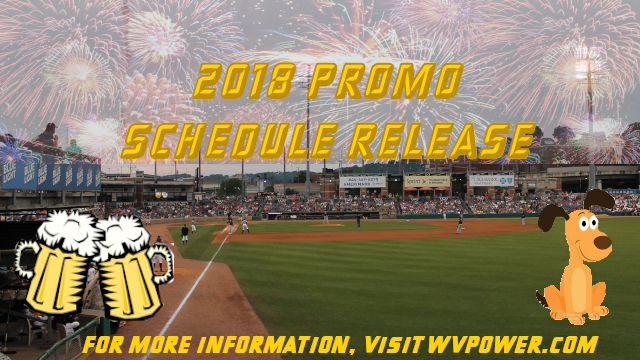 View the entire 2018 West Virginia Power Promotional Schedule! The Power kicks off its 14th season on April 5 as the club squares off with the defending South Atlantic League champion Greenville Drive at 7:05 p.m. at Appalachian Power Park. The first 1,000 fans who traverse through the gates will receive a personal 2018 magnet schedule giveaway, while all fans can enjoy the first of 11 Thirsty Thursday specials that evening. Patrons can enjoy $1.00 12-ounce beverages and $2.00 16-ounce cans through the end of the seventh inning during every Thursday home game, sponsored by WKLC. The Opening Night fun does not stop there, as the best fireworks display in the Kanawha Valley returns to Appalachian Power Park following the contest on April 5, courtesy of Electric 102.7. BrewFest CharlieWest, presented by Rock 105, highlights the April promotional slate, with the first 1,000 fans receiving a West Virginia Power pint glass, and a beer festival featuring live music and some of the best craft brews from the region set to follow the game's conclusion. For $30, fans can gain access to the game and five craft beer vouchers. April also marks the return of three fan favorite weekly promotions, Kid's Sunday Funday, Family Buck Night and Two For Tuesday. On Sundays, children ages 12 and younger can play catch in the outfield prior to the 2:05 p.m. first pitch and run the bases after the final out, sponsored by SMART529 College Savings Program. Plus, several Power players will be available for autographs. Family Buck Nights commence on Monday, April 9, where fans can purchase box seats for $3.00 and general admission tickets for $1.00, along with $1.00 hot dogs, popcorn and 12-ounce Pepsi products. On April 10, the Power's first Two for Tuesday special gets underway, where fans can enjoy two-for-one 16-ounce beer cans and other special concession items during most Tuesday home games. The first home series concludes with the first of two Grand Slam School Days on Wednesday, April 11, as the Power wrap up their three-game set against the Lakewood BlueClaws with a 10:35 a.m. first pitch. The second Grand Slam School Day occurs on Tuesday, April 24, when the Power entertain the Rome Braves at 10:35 a.m.
Other highlights for the season's inaugural month include Awful Day on Saturday, April 21, along with our first Pets in the Park Night on Wednesday, April 25. The Power will offer two Family Buck Nights, Fireworks Nights and Kid's Sunday Fundays, one Two for Tuesday and three Thirsty Thursdays in April. May kicks off with an action-packed first homestand, as the Power host a mini-comic con, Star Wars night, Pirates and Princesses Night and Harry Potter Day over four consecutive days beginning on Thursday, May 3. Piggy-backing the Power's night dedicated to fighting the Empire is our first postgame fireworks show in May, sponsored by the West Virginia Lottery, while Saturday's evening of swashbuckling includes a Golden Baseball giveaway and Sunday's magical afternoon concludes with a screening of Harry Potter and the Sorcerer's Stone. Wrestling Night returns to the diamond on Saturday, May 26, while Power to End Stroke Night on Thursday, May 17, presented by the American Heart Association, and Military Appreciation Night on Friday, May 18, with postgame fireworks sponsored by UniCare Healthplan of West Virginia, dot the campaign's May schedule as well. Two other giveaways are on the docket for May, with details to be announced later, along with two Family Buck Nights, a Two for Tuesday, two Thirsty Thursdays, three Fireworks Nights, a Pets in the Park Night and three Kid's Sunday Fundays. June's promotional focal point comes in the Power's final home stretch of the first half from June 15-17, as the Delmarva Shorebirds flock to Charleston for the first time in 2018. The promotion-filled weekend commences with another postgame fireworks spectacle following Friday's opener, sponsored by Huntington Bank. On June 16, the team will hold its annual West Virginia Day celebration with a bluetooth speaker giveaway to the first 1,000 fans in attendance, sponsored by Appalachian Power, before Campout Night takes over the ballpark. The Power conclude the first half by paying homage to Lincoln County through a special day at the park, presented by Lincoln Primary Care and the Southern West Virginia Health System. Other nights in June include a Family Buck Night and two Two for Tuesdays, Thirsty Thursdays, Fireworks Nights, Kid's Sunday Fundays and Pets in the Park Nights. July is jam-packed with promotions at Appalachian Power Park, jumpstarted by our 4th of July Independence Day Celebration, which will include an extended version of the best pyrotechnics show in the Kanawha Valley, presented by Highmark West Virginia. The festivities continue on Friday, July 6, with Hatfield and McCoy Night, where the fight for The Golden Pig will reach its pinnacle as the Legends play their final game in Charleston in 2018. Purple Power Night, an evening devoted to supporting pancreatic cancer, is slated for Saturday, July 7, while PBS Kids Day is on tap for Sunday, July 8, with several cartoon characters set to be in attendance. On July 14, Thomas Health System is proud to sponsor Ryan Switzer Night, with a special bobblehead giveaway of the current Dallas Cowboy available to the first 1,000 fans, while July 27 is slotted for Faith and Family Night, with a performance from the Jason Lovins Band and postgame fireworks presented by TransCanada on tap. The Power will host a Christmas in July Food Drive on Saturday, July 28, along with a bucket hat giveaway to the first 1,000 fans, courtesy of IHOP. The club also has Game Show Night on the agenda for July 16. The weekly promotions come in bunches in July as well, with two Family Buck Nights and Fireworks Nights, three Kid's Sunday Fundays and a Thirsty Thursday on the schedule. The month of August sees the Power's home season come to a close, but not without some more outstanding promotions, most notably a Trevor Hoffman statue giveaway as a part of Wheelers weekend on Saturday, August 18, to the first 1,000 fans, courtesy of Charleston Building and Construction Trades Council. Additionally, the club will host West Virginia Tourism Night on Thursday, August 16, sponsored by the Charleston CVB, before celebrating Chuck's birthday on Monday, August 20. On August 4, its Back to School Night at Appalachian Power Park, with a 2-in-1 backpack giveaway to the first 1,000 fans on tap courtesy of Ortho Clinic, while Wednesday, August 29, is the final Pets in the Park excursion of the season. Our weekly promotions conclude in August with two Family Buck Nights, Two for Tuesdays and Kid's Sunday Fundays, three Thirsty Thursdays and two Fireworks Nights to round out our promotional lineup for 2018. All promotions, giveaways, appearances and events are subject to change without notice. More promotional details will be released as they become available. For more information on any of our exciting promotions, call 304-344-BATS or visit wvpower.com. The Power kicks off its 14th campaign on Opening Night, April 5, with a four-game series against the defending South Atlantic League champion Greenville Drive, followed by a three-game set with Lakewood. The team will play 15 home games in April, May and August, 12 in June and 13 contests inside their friendly confines in July. The club's home slate concludes on August 30, our final Thirsty Thursday of the season, after a 7:05 p.m. tilt with the Hagerstown Suns.